The central cone is used to accommodate the necessary machinery and equipment such as blowers, filters, electric control boards, compressors, IBAU Pumps and more. 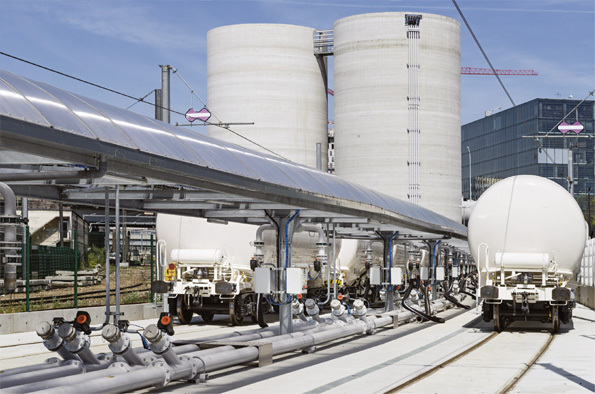 Silos with a raised bottom – built as drive-through silos – are favored, because no intermediate transport is required to feed the packer or the bulk loading facilities. 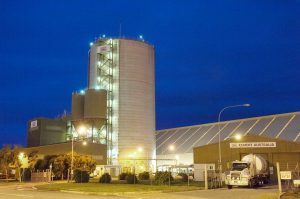 The world’s largest silo in Townsville, Australia: The silo has an internal diameter of 28 m with a wall height of 44 m, topped by a 5.5 m high parapet, reaching a total height of 49.5 m.
Inside, a 22 m high cone with a 60° inclination is installed on the silo floor with a distance of 2 m to the wall. Twelve evenly spaced outlets are situated on the floor around the cone, equipped with flow-control and cut-off gates leading to fluid slides inside the cone.